Proactively support all functional areas using PeopleSoft Financials (GL/AP) in terms of their information, systems and process needs through design, development, implementation, maintenance/support, and management of effective, efficient and innovative technology solutions. Partner with and provide leadership to Finance management and staff through active participation/consultation in strategic planning in support of the overall Finance mission as well as the missions of the various other functional areas as needed. Liaise with management of non-Finance areas of the company on the correct and appropriate use usage of Finance data and systems in support of their business goals. Continually and proactively monitor operations in all functional areas of Finance to identify and address information and/or systems needs in support of business goals. Design, develop, communicate, document, configure, implement, test, train and maintain technology and process solutions in support of all functional areas of Finance and non-Finance. Develop and maintain appropriate relationships with decision-makers in all areas of the organization (not limited to Finance leadership). Manage large or multi-disciplinary/multi-phased projects including planning, staffing, and budgeting. Develop and deliver functional training to PeopleSoft Financial users as part of the implementation of new or enhanced functionality. Maintain current knowledge of industry and Finance trends and tools to provide best practice insight and best-in-class recommendations to management. Manage and direct resources in support of all Finance initiatives including third party and hosted applications as well as in-house bolt-on and complimentary applications. Manage Finance issues to resolution through consistent, timely and appropriate recognition, tracking and analysis. Ensure that all applications and processes used in Finance are appropriately and effectively integrated into a cohesive and sustainable process. Ensure that all components as well as their usage are consistent and in compliance with all applicable regulatory, departmental, I/T, and corporate standards, policies and guidelines. 4 years experience with PeopleSoft Financials version 7.5 or higher including at least 1 full implementation. Experience with Lean transformation principles: use of Lean tools to eliminate waste from the accounting processes while maintaining financial control; support the lean culture by motivating continuous improvement at every level of the Finance organization; provide root cause analysis and other information that is relevant and actionable, empowering continuous improvement at every level of the organization. Ability to manage large and/or multi-faceted projects. Proficiency with PeopleSoft's Application Designer and Component Interface functionality. Experience in analyzing, coding, and tuning SQL. Knowledge of, and experience with, creative application of all Microsoft Office products. 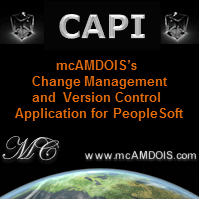 Demonstrated ability to interact effectively with all levels of users and management.